Audio specialists Denon has unveiled a range of wireless speakers and is looking to get a piece of the Sonos multi-room streaming pie. 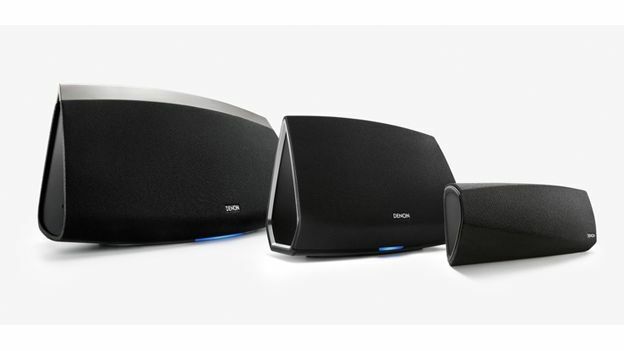 Dubbed HEOS by Denon, the speakers are the company's own take on home music streaming. They'll be able to stream music from local storage and the cloud, according to Denon. The range will launch with a selection of three all-in-one speakers, the HEOS 3, HEOS 5 and HEOS 7. All link up to an existing Wi-Fi dual-band 802.11n network. One neat trick over rival products is that Denon's HEOS range can link up for synchronised playback in different rooms. They can– of course – play different music too. Audio-wise, the come with MaxxAudio by Waves with Denon claiming that its inclusion will mean better sound enhancement than rival DSP systems. Like other streaming services, the speakers will be controlled via iOS and Android apps. The top of the range HEOS 7 comes with five class D amplifiers, two custom tweeters and mid-woofers, a sub-woofer and two radiators. In other words, a lot of boom for your buck. The middle of the range HEOS 5 will come with four class D amplifiers, two tweeters and mid-woofers and a passive radiator. Finally, the HEOS 3 is comes with a two channel digital amp and dual full range woofers. They all have the same range of USB and aux-in inputs, along with the ability to stream music from “top cloud services”. Though Denon hasn't confirmed which cloud services are on board yet. Denon hasn't announced UK pricing yet, but they will be available in the US from $299 to $599 depending on the model. That's between £178.50 and £358 in the Queen's money. They'll arrive in US stores from June. We'll be pestering Denon for UK details.